Nappanee is what I tend to think of as a ‘prototype’ Amish community, smallish to medium-sized, centered around a single small town. It’s the type of place where once you leave the main town of a few hundred or thousand souls you’ll find Amish homesteads radiating out in a number of miles in any direction. Little or no suburban build-up, unclogged rural roads, and generally a slower feel to the area. The Kalona, Iowa and Arthur, Illinois Amish communities are similar in this regard, and true to form, the prototype Amish town usually has a small-to-decent sized Amish tourism industry going. Nappanee, with its Amish Acres attraction, is one of the most successful in this regard. Nappanee is a nice settlement. I sold the Family Bible Library and other books to Amish here in 2006, and met many of the local families with 8th-grade and under kids (or rather ‘children’; ‘kids’ are baby goats after all, as a Lancaster Amishman once let me know). On the whole Napanee seemed a bit less well-off at the time than Elkhart and Lagrange Counties just to the northeast, though Nappanee is closely tied to that community and has also been heavily involved in the RV industry. There is a spot of farming here and there, and some small businesses. Furniture makers, a book shop, dry goods, lighting implements, and a natural foods/medicines dealer are among the Amish firms represented in Nappanee (more on Amish furniture in Indiana). 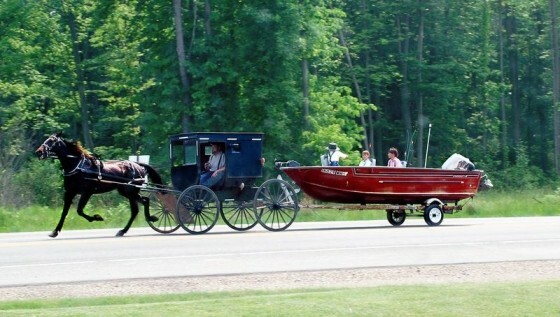 Nappanee is also one of the larger Amish communities, with a total of 37 church districts as of last year, technically the third-largest in Indiana. The Young Center for Anabaptist and Pietist Studies has the settlement as the 6th-largest community in the nation, by number of church districts, though it’s still well behind Elkhart-Lagrange or even Geauga County, Ohio, number four on the list. To the north/north-east, you begin to run into the Old Order Mennonite community, around the town of Wakarusa, which is of a much smaller, but still significant, population. Buggies are boxier, patterned and plaid clothing is worn, you’ll notice power lines leading to the homes, and men are clean-shaven. Like Lancaster County or parts of Ontario, this spot of Indiana is one where you’ll find Amish and Old Order Mennonites living in close quarters. This post was inspired by an article I just read on two ‘tornadoes’ in the Napannee region: one real, the second economic. Chris Serio Martin at the Elkhart Truth describes how this small community has pulled together in trouble times, first after a catastrophic twister struck in 2007, and most recently after the economic downturn, which has had unemployment in the region near the nation’s highest. A side benefit of the downturn, according to local official Larry Andrews, is the closer ties between the Amish and non-Amish populations in the area. And, Andrews offers a new term for Amish businesses: “Shingle shops”, which are “rural shops that have a shingle sign on the road welcoming customers”. Catchy enough! Going through northern Indiana in horse and oxen drawn wagons, staying on Amish farms along the way, was the best experience of my life. I love God, and the word of God. It is nice to see a people that Believe in living there lives in purity and they seem to be a good honest hard working folks. I hope one day I can spen some time there to visit and get to learn more about them. Hands on is the best way to learn. What Info do you have on the Rush County Indiana Amish! Lots of Historyical Bridges; my Late Dad lived in Rushville ‘ been gone for over 41 years! I knew nothing about he Amish; until I begain to Read your Website! Rushville is located Approx. 1/2 fro Indianapolis & to the Cincinnati Western Burbs! I don’t live to far from nappanee Indiana.all I will say is that I have amish friends there. They are the nicest people that I have ever met.when I first rode in a buggy the guy had said you look like you enjoy this. He asked me who and where the amish came from i told him about Jacob amamen.He looked @t me and said you know about us. I said ya I do. Now I go visit them 3 to 4 times a year. And I enjoy going to there place. I love nappanee.